First, I have to apologize. I may have started losing my mind. This past week has been filled to the brim with obligations, fun and otherwise. Mostly fun. Halloween is tomorrow and I’ve been trying to pack as much fright filled excitement into this week as possible. Which means that I have neglected writing here. I’m a firm believer that one should not apologize for lack of writing on a blog because probably no one noticed but the writer themselves. So I’m really only apologizing for the photo above, because well, you can see it’s not so great. I’m going to make up for it by telling you about one of my favorite restaurants that you probably haven’t been to. It’s a lovely spot in Atwater Village called Viet Noodle Bar. Now let me tell you why this place is so awesome. It’s an omni restaurant but they have two vegan dishes clearly labeled on their menu. The tofu basil banh mi seen above and a jackfruit noodle bowl. Both are tasty and refreshing. 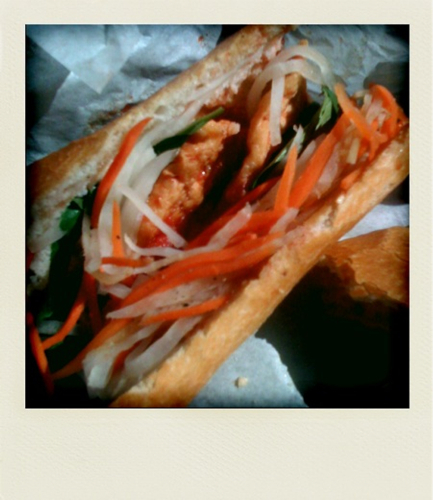 The banh mi is a crunchy french roll filled with tofu, seasoned tomato sauce, basil, carrots and daikon. It has a hearty filling with a fresh, sweet crunch. I love this thing. I probably get it once a week for lunch. The noodle bowl is equally as delicious and even more filling. You really can’t go wrong with noodles and jackfruit. The other great thing about this place is that it has a communal table and counter and is filled with shared books. I often go and read a couple chapters of a novel while I lunch. The atmosphere is relaxing and modern. A few notes though before you go…it’s cash only so make sure you bring something besides your credit card. Also, there are things on the menu listed as vegetarian and they are not vegan. I was told they have mayo or something bizarre in them. Just stick with the stuff that is marked as vegan and you’ll be set. And on that note I’m going to leave you with a photo of Shawn’s pumpkin from last year because it’s so cute and we haven’t had a chance to carve pumpkins yet this year. Happy Halloween! oooh i can’t wait to check this place out! thanks for sharing the word. this place sounds delicious! thanks for the info! you had me at jackfruit 🙂 and cute pumpkin!! that’s soooooooo what i was thinking! I think that photo is awesome, it looks delicious! Glad you have been trying to pack in as much halloween fun as possible.